Why Do The Irish Speak English? If you’ve been following this blog, you know that Irish is the first official language of Ireland…that it is taught in schools in the Republic of Ireland, and that it can be seen and heard just about everywhere on the island (especially if you go looking for it). You may wonder, then, why everyone in Ireland speaks English (even if they also know Irish) and, further, why there often seems to be a great deal of angst there surrounding the Irish language. 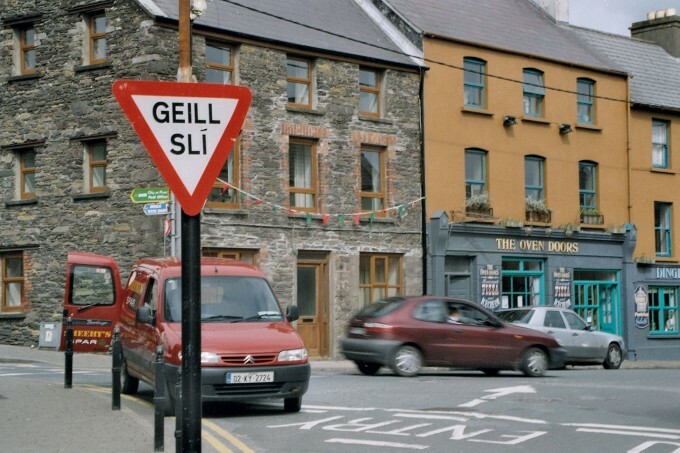 Where have all the Gaeilgeoirí gone? Despite centuries of attempts to suppress it, Irish was the majority language in Ireland right up through the 19th century. How could a language that was spoken by most of the people all but disappear, to the point where many people outside of Ireland don’t even realize that there is such a thing as an Irish language? It would be easy to point to laws restricting the use of Irish, such as the infamous Statutes of Kilkenny, as culprits in the disappearance of Irish. “Easy,” but not really valid. These laws were aimed primarily at the Norman population, which the English government thought was becoming “too Irish” (and were, for the most part, unenforceable in any case). They had no effect on the Gaelic majority. One institution that is credited with doing a great deal of harm, if not to the language as a whole, at least to individual Irish speakers, was the national school system. Children were not only forbidden from speaking Irish at school (and brutally beaten or humiliated — or both — for doing so), the teachers often enlisted the aid of the parents in suppressing a child’s use of Irish at home. A child who persisted in speaking Irish at school might be sent home with a tally board around his neck, with instructions for the parents to make a mark on the board whenever the child said something in Irish. Each mark meant an additional blow from the schoolmaster the following day. If it seems odd that parents would cooperate with such a system, bear in mind that the national schools were the only route to an education, and perhaps a ticket out of poverty, for their children. While outside of Ireland this is often referred to as the “Irish Potato Famine,” in Ireland it’s known as An Gorta Mór: The Great Hunger. During this time, around one million people, most of them Irish speakers, died. Another million emigrated, reducing Ireland’s total population by around 25%. Among those who were left, many, forced off the land by eviction, relocated to the cities, where English was essential. For the first time in its history, Irish was a minority language in its own country. Despite the best efforts of promoters of the language, Irish has never really recovered from the Famine. In the latest Republic of Ireland census, only 77,185 people indicated that they speak Irish daily outside of the school system (source: Wikipedia: Irish Language). You can dig deeper at Ireland’s Central Statistics Office in their census figures. The Gaeltacht (a collective term for traditional Irish-speaking areas) has come under a lot of pressure in the 21st century, as old people die, young people emigrate (if not to other countries, at least to the cities, where the job prospects are better), and new people, most of whom who don’t speak Irish, move in. There’s a very conflicted attitude toward the language throughout Ireland. Although it does have many enthusiastic supporters, a fair number of Irish people are, at best, ambivalent about the language, and, at worst, want nothing to do with it. The reasons for this are varied. Older people often cite unpleasant experiences with studying the language in school (a situation that seems to have improved). On the positive side, however, evening Irish classes are often full of adults who regret not having put as much effort as they might have into learning Irish while at school. Younger people may say that they don’t see the need for it. English is the language of technology and commerce, and Irish isn’t useful to them for travel, so why bother? On the other hand, there is a real movement, especially in the cities, of parents (not themselves native Irish speakers) raising their children through Irish. This, combined with the growing demand for Gaelscoileanna (Irish-medium public schools) may well be one of the best things that could happen for the language. You can meet one such family, Siobhain Grogan and Mick Moriarty and their three children, in this video. Siobhain won the 2012 ELL (European Language Label) Award for, among other things, the children’s books she’s written in Irish. There have also been positive developments regarding the Irish language in Northern Ireland, with a growing number of people on both sides of the political table learning, and taking pleasure in, the language. Perhaps the greatest growth in interest in the language, however, has been outside of Ireland. The internet has made it possible for people from all over the world, many of them descendants of Irish speakers driven from home by the Famine, to learn and promote the language. In fact, 2007 saw the official opening of the very first designated Gaeltacht outside of Ireland in Ontario, Canada. Situated about 250 kilometers northeast of Toronto Gaeltacht Thuisceart an Oileáin Úir serves as a center for Irish language and culture and will eventually have housing for 100 Irish-speaking people. To sum up, while the Famine and the national schools delivered a severe blow to the Irish language — one that might well have killed it — it was not, in fact, a death blow. Whether or not it achieves pre-eminence in Ireland, however, the fact that I’m writing this and you’re reading this attests to the fact that Irish has a future. Did you already know all this about the history of the Irish language? If you’re currently learning Irish, teaching Irish, or have plans to study Irish, what are your reasons for doing so? Let us know your thoughts below! Learn Some Irish Christmas Carols! Learn to introduce yourself in Ireland's native language. Sent directly to your email inbox. "We don't sell or spam your details." - Eoin Ó Conchúir, Founder, Bitesize Irish. Very interesting subject. On the positive side of it: for example two weeks ago I spoke with a young mother, who has a young son. He’s still too young for school. But she has already decided that she wants him to be fluent in Irish as he grows up. She’s not so fluent herself, but will be sending him to the local gaelscoil (school through the Irish language). I would argue that TG4 has also been a huge step up for the Irish language. It almost immediately took its place as an up-to-date, interesting, youthful service. Their production is amazing, despite what limited resources are available. And best of all, they stream online so you can watch it wherever you are. Overall, there hasn’t been a better time to be learning Irish in the past decade, two decades, heck: past century. In answer to your other question, no, Bitesize isn’t a physical school. It’s a purely on-line program. That should say “there are schools.” I can’t seem to type coherently today! I completely agree re TG4. It’s not just that there’s television in Irish, but it’s GOOD television. I often find myself wishing that I could watch it on my regular TV rather than my computer…I’d pay for premium cable services if I had TG4 as an option! I’m especially happy that they make it available worldwide via their website. The one thing I would change is the subtitles. It’s nice to have them when you’re first learning, but at a certain stage, it would be nice to have the ability to turn them off…or even to have subtitles in Irish! It would also be lovely to be able to buy back episodes or boxed sets of such shows as Ros na Rún and Aifric. But that kind of thing takes money, so not likely to happen in this economy. Still, they do a brilliant job with what they have, and their programming is first-rate, so I can’t really grumble! I hear you about being able to watch it on normal TV. The best medium we use is a media PC hooked into the TV. But even then, you need to switch on the PC, load up the browser and put on the channel (this time for Slovenian TV). Does TG4 do streaming for phones and tablets these days? Agreed about the subtitles. Even on the main Irish broadcast, the subtitles are hard-coded. I feel sorry for the Gaeltacht residents! How does TG4 play on the iPad… do they have their own app for streaming? Or do you just visit the site in the browser? As far as i know, they do not have an app, i just access it like any other website as if on a regular computer. I would love to be fluent in Irish! i was brought up just north of the border in the 60s where we went to Irish language classes in the evenings at the GAA hall, and I managed to pass an ‘o’ level in Irish….but I am hopeless at speaking or understanding others. Currently working as a teacher in England, I would love to be able to move back to Ireland and teach there – but I would have to be fluent and I can’t see that happening any time soon. I visit the west Kerry gaelteacht every summer and it is so lovely to sit in pubs or go out shopping and hear people chattering away in Irish. Another happy thing is that the primary school in my village in NI is now a gaelscoil so the will to be fluent in our native tongue is still going strong. That was one of the things I found so nice in Gleann Cholm Cille…people were willing to speak Irish around visitors. I think having Oideas Gael helps with that…they’re used to an influx of visitors every summer who want to speak Irish, and it’s a boost to the local economy. I can understand the situation of Irish in Ireland, I’m Catalan and for centuries Spain has been trying to suppress my language and my culture. We have an educational bilingual system guaranteed by European institutions, failure at school is lower in Catalonia than in the rest of the country, even spanish speakers’ parents in Catalonia want their sons and daughters to learn in this bilingual system, nevertheless Spanish government doesn’t stop to attack our language. All causes have their defenders, but Catalan just has ourselves. Yo soy de origen Vasco y se muy bien de lo que habláis… Mi familia solamente habla el Castellano, cosa que me provoca gran tristeza. Estoy aprendiendo a hablar Irlandes, y me gustaría algún día aprender también a hablar Euskera (Vasco). También dejarme decirte que el lenguaje Catalán también se me hace hermoso, y espero que la situación mejore para todos. Thanks for sharing, Berta. Irish has a lot to learn from the Catalans, I think. I am learning slowly, but surely. I have had a love for the Irish language since I first saw “The Quiet Man” at the age of six. I am saving for my first trip to Ireland and would love to be able to speak to people in Irish if they would tolerate my Texas accent. My ancestors immigrated because of the Famine; they were not able to return. Learning it is a dream come true. Once I have a better computer, I’ll be able to begin watching TG4. Thank you for your site and the tutorials. you will love Ireland, it is very beautiful and people are friendly, kind and sympathique. I visited the island last summer and I really enjoyed. Great place, great people and great moments! Ta fairge mor orm nuair a cloisim den “National School System”… Is daoine olc na Sasanaigh, gan amhras ar bith. Ba ceart doibh bheith nairithe ar fad. Ta athas orm faoi na daoine ata ag foghlaim an teanga aris eile da ainneoin sin. Fan go bhfeicfimid, mar a deir Eoin. Sea, fan go bhfeicfimid! Mar a dúirt tú, tá daoin in Éirinn, agus thar lear, ag foghlaim an teanga (tú fhéin san áireamh! ), agus is maith an rud é sin. Conas mar atá ag éirí leat maidir le foghlaim na Gaeilge? Silim to bhfuil me ag dul chun cinn, agus ag dul go tapaidh… Ach ni furasta e, ar chor ar bith. Ta moran dicheall romham. Cad is doigh leat? Bhfeul, tá cuma air go bhfuil ag éirí go hiontach leat! My family also came to the US from Ireland. I have a love for the history, the language, and the people that helps me to feel grounded. Learning the language is a real connection to family members that I was never able to meet. Spending two weeks in Ireland over the summer was nothing short of wonderful. Meeting Eoin and Sasa was one of the very best parts! The language is difficult but I am determined to learn. I think it is great that it is being taught in the schools there. What an amazing and historical gift for Irish children! It sure was wonderful to meet both of you during the summer. Maith thú, well done again for the Gaeilge you were using. I agree with you about the schools. Indeed, if they were to remove that teaching by default, I think it would be a real loss for Ireland. Speaking to a primary school teacher who works in a town in Galway this week, it sounded like it’s a tough job for him to get the kids learning. It’s a multi-generational attitude (mainly negative, or at the very least apathetic). So there’s a mix of good news with Irish language schools, the teaching of it in English language schools, but then the attitude of a lot of kids too. Your point about the famine is very interesting. Of course, all of Ireland felt the effects of the “Great Hunger,” but Leitrim took it particularly hard. To this day, it still has the smallest population of all the counties and that started during the famine from what I’ve been told. I probably speak better Irish now than my native born parents did! You’ve already turned the tide with what you have been learning, in that case! Did they systematically record the main language of the person? Thanks, Eoin, for this background information. It is helpful to know the various factors that changed the use of language. Language flavors the thoughts and perceptions of a population. I am interested in learning the language to develop a fuller appreciation of the songs, poems, and literature of my family’s heritage. It’s thanks to Audrey for this article. And go raibh maith agat to you for the feedback. Certainly true how language and culture inter-mingle. An insight into one is an insight into the other. Thanks Eoin for the historical perspective on the challenges that have faced the continuing existence of the Irish language, it is obvious that your site and it’s outreach to the sons and daughters of Eirinn is a labor of love, thanks again. I agree that TG4 is a great asset to those of us desiring to strengthen our grasp of Gaeilge! Unfortunately for myself the only choices I had as a lad back in high school here in the U.S. were German, Spanish, French and Latin, I would have loved to have learned Gaeilge and the cultural foundations of the language back when, now there is a lot of catching up to do! A lot of catching up, perhaps, but don’t let that hold you back! We all start someone. If we don’t start, we won’t get anywhere 🙂 It’s worth it, I think. It should be noted that many many children in the occupied part of Ulster [the six counties] are taught Gaelic and not only that, they are eager to learn and further their knowledge of the language,spending their holidays going to Gaeltacht areas to speak only Irish for the time they are there,from what I am told by some who have done this [children in my wider family] if you speak English you are asked to leave!! Do not forget ours is an ancient culture,established many century’s before there was any kind of coherent widely spoken language now called English.Of course the way the world has evolved with the English wanting to control and dominate the entire planet EARTH, that language is the most understood and used for all practical purposes and of course has been foisted on the Irish as elsewhere. Culture can’t be bought,[it can be shared] and it can’t be taken away. Because the British have no culture of their own [apart from morris dancing] they are unable to understand anyone else love of theirs,so keep up the good work. No comment on British culture, but thanks for sharing the experience from Northern Ireland. Yep, those summer Irish colleges are very popular. Check out our post Awesome modern songs sung in the Irish language which comes from the Coláiste Lurgan summer Gaeltacht college. Go rabia matiz ágata, a Padraig… Is fior e sin debut, gan amaras. That didnt come out… Stupid iPad. What i meant was: Go raibh maith agat, a Phadraig, Is fior e sin, gan amhras. Ni cultur ar bith ar na Sasanaigh, ach bheith ag maru daoine neamhchionntacha agus ainmhithe agus crainn agus leirscrios ar an nadur. Utterly ridiculous comment about British culture. Really sad that you taint a very interesting website with racism and prejudice. Same happened in South Louisiana, USA. New Orleans and most of the southeastern part of Louisian was originally colonized by the French, even when Louisiana came under Spanish control, French remained the majority language. Later, furing the Grande Derangement ( the expulsion of the Acadians ), French people left Nova Scotia and Acadia ( Eastern Canada ) when they were chased out by the english. Many mae th voyage and settled in south Lousiana. The term Cajun is a corruption of the word Acadian (Acadian (M) Acadienne (F) ). In the 20th century movements were underway to discourage the use of french and similiar laws, rules in school began to be enforced. Luckily, a small group notice that the unique Louisiana French was dying out and along with it the culture, so they also began to do things to preserve the biggest movement is The society for the Development of French in Louisiana. I really am glad I read this article. My grandmother’s family came from Ireland. I wondered why I never heard her speak irish. Now I know. This was very informative and I am so glad that you shared it with me. i think the education system to a degree and also emigration too. but i think the government has something to do with it also. the Dai’l does not even conduct debate in gaeilge and has become to play a more ceremonial role and traditional roll even the. that is not to say that british rule has not had it s part to play, for the tried for hundreds of years to systematically destroy and alienate the irish people. i think that the language is still very much relevant today in as it secures a sense of identity and nationality. but it is a shame as learning gaeilge is often associated with being green and being from the republic. i read with great interest the about 6 weeks ago now on BBC northern ireland that steps are now being taken to introduce the language again up there to and that its no just belonging to the catholic stigma. so hopefully these steps can be a positive step towards better relations of the 2 irelands. I spent all my school years struggling to learn Irish and managed to scrape a “D” in pass level in my final school exams. I didn’t get enough points for my choice of third level education. I had to repeat my exams, I blame the teaching of Irish in it’s present for for losing a whole year of my life. A recent publication “The Revival of Irish – Failed Project of a Political Elite” outlines how “The Revivsl” was a political ideal as opposed to a necessity. Here is my blog review on the topic if you like. You must be proud of your language. It’s a part of you. Don’t make it disappear. I’ve heard that the Catholic Church was actually a strong proponent of English over Irish, viewing it as a means of upward mobility for the poor masses. I live in New Jersey and there’s a Gaelic school in my area. A few of my friends of Irish ancestry attend it and I know at least one girl who’s fluent in the language. This amazing course, delivered by email over a month, will get you from zero to "Hello, my name is..." in the Irish language. Plus you'll get weekly exclusive newsletter updates. As soon as you sign up, we’ll instantly give you our popular ebook “The Irish Language: Your Key to Gaelic Ireland”. Copyright © 2019 Bitesize Irish Gaelic Ltd.